A walk in downtown Portland will convince anyone that a significant population is experiencing homelessness. With housing in Portland in short supply and the decrease of federal funding for affordable housing by 64 billion over the past 30 years has created our mass homelessness issue. 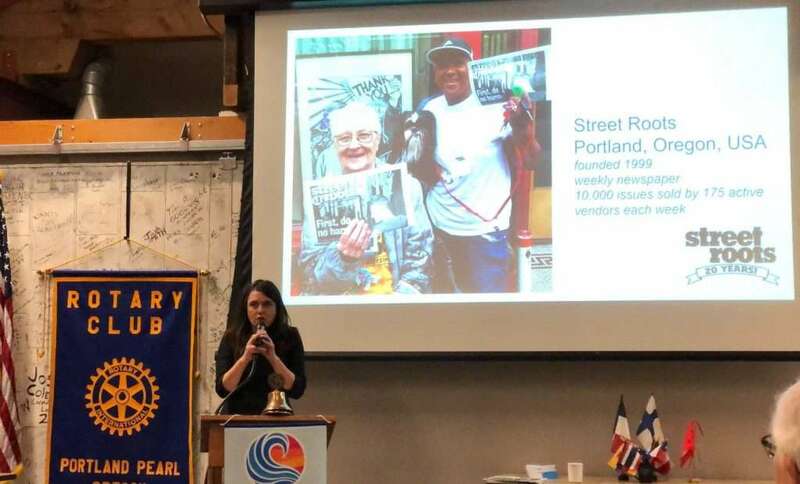 Pearl Rotarians heard on Jan. 22 about one Portland employment program, Street Roots has employed people experiencing homelessness for the past 20 years. Street Roots publishes its own carefully edited weekly newspaper that is then sold by associated vendors. The publication, written by professional journalists, mainly covers local Portland news, with special attention to issues of poverty. Kaia Sand, Street Roots Executive Director, told Rotarians that as many as 175 homeless individuals each week are charged .25 cents per copy and are sold for $1.00. Sands reported that as many as 500 individuals are employed as vendors during a typical year. Circulation of paper runs about 200,000 copies. Earnings will vary by vendor but are often around $700 per month.